Over a million participated in the march of the kings in Poland. 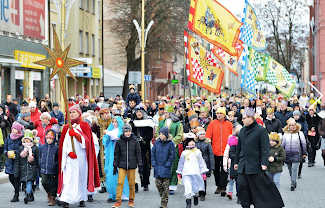 In Poland, more than one million people participated in the march of the three kings in more than 750 cities on 6 January, 2019. The theme of this year's "World's Greatest Nativity Play" was "Renewing the Face of the Earth" and this year it was designed to commemorate John Paul II's words to the world 40 years ago. During the marches in the various cities, therefore, the words of the saint from Poland were intensively recalled from his books and the encyclical Redemptor Hominis. Andrzej Duda, President of the Republic, also addressed the participants in a welcoming address this year. The three kings crossed the streets of Poland. Colorful costumes, exotic animals, performances and pastorals - was how the celebration of the Three Kings was celebrated throughout the country. The Epiphany, in the Christian tradition, commemorates the Magi from the East, who came to Bethlehem to worship the newborn Jesus. The colorful derivatives of sages from the East were often accompanied by horses and even camels. The performers of the royal roles imposed multicolored robes, and the citywalkers carried banners and sang solemn songs and pastorals. The inhabitants of Lębork in Pomerania and Stare Juchy (Warmian-Masurian) participated in the performance during which the monarchs made their gifts to the Child, while the Bydgoszcz retinue went through the streets of the city in the company of a distinguished two-hump camel. According to tradition, Kasper, Melchior and Balthazar were representatives of Europe, Asia and Africa. In addition to devotion, each of the wise men also gave the Child the gifts that were myrrh, incense and gold. The relics of the kings are still kept in German Cologne. In Jelenia Góra in Lower Silesia, the Kings were accompanied by highlanders, and in Lodz joined by snow-white angels on stilts. - There were large crowd and most were joyful, despite the cold weather.